It is a simple process to order business checks online. The biggest hurdles will be what design to choose, which company to buy from and how to do it securely. The major steps involved in the process need to be understood so as to make the process seamless. The first step is to open a business checking account at a bank or financial institution. With the number of designs to choose from, this might not be simple for many small business owners to. The easiest decision is whether or not to use the company’s logo as the design. In this case, all that is needed is to have the logo created if there is none. This can then be sent to the printing company to be used. Some companies may even create these logos for their customers if asked. Other custom designs can also be submitted to be used where needed. Before going wild with designs, talk to your bank. Not all designs may be accepted by all financial institutions. While this is rare, it is better to avoid spending money then finding they can’t be used. Also keep in mind, not all designs are appropriate for business purposes. When you order business checks online they can be used as a branding tool, and you want to make the right impression. There are many companies on the internet offering check printing services. Not all are reputable and some will not provide quality products. These days buying anything online is generally quite safe. Most internet shoppers have become savvy at using the technology, but there are still rules to follow to minimize the risk of online scams. The first rule of online shopping is to buy from a secure website. Secure sites frequently have a URL starting with 'https' instead of just 'http'. They also have a closed padlock located at the bottom right side of your browser window. Even sites that seem to be secure may not be, so do further research. This may include looking for reviews. When it comes to your financial security and avoiding identity theft, it pays to be careful. When it comes time to place your order, follow your gut feeling about the company. There are so many companies to choose from that passing on one with seemingly great deals may save you in the long run. Scams are aplenty and it is important to know how to shop safely. Once all the above details are observed, it is safe, easy and convenient to order business checks online. Just make sure your bank accepts financial instruments from the company you have selected. 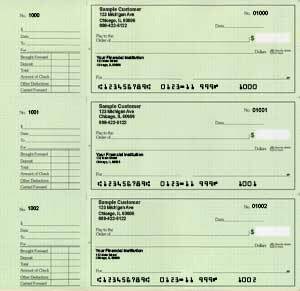 Thanks for sharing the post about "order personal checks online".